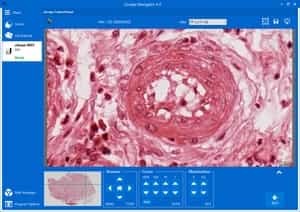 uScope Navigator-Browsing Slides :: Microscopes Intl. The overview image displays a thumbnail image of the slide and allows you to select where to position the objective. You may swap the display of the overview image and objective image to help locate and target smaller parts of the image. Navigation controls move the objective around the slide. 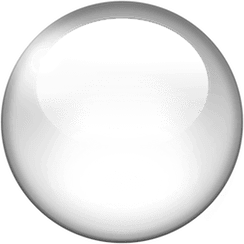 Illumination controls change the amount of light output by the slide illuminator. There are four manual focus levels that work similarly to a traditional microscope. There are three levels of autofocus that work by automatically moving the objective to obtain the best focus. 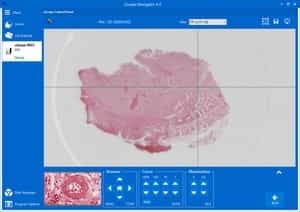 The intuitive controls of the uScope Navigator application make it easy to browse or examine a prepared slide with a uScope Digital Microscope. An overview image of the slide. 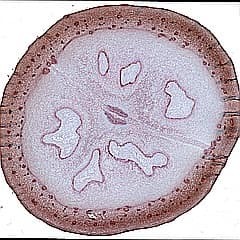 An image of the slide under the objective. Image controls that zoom in/out.